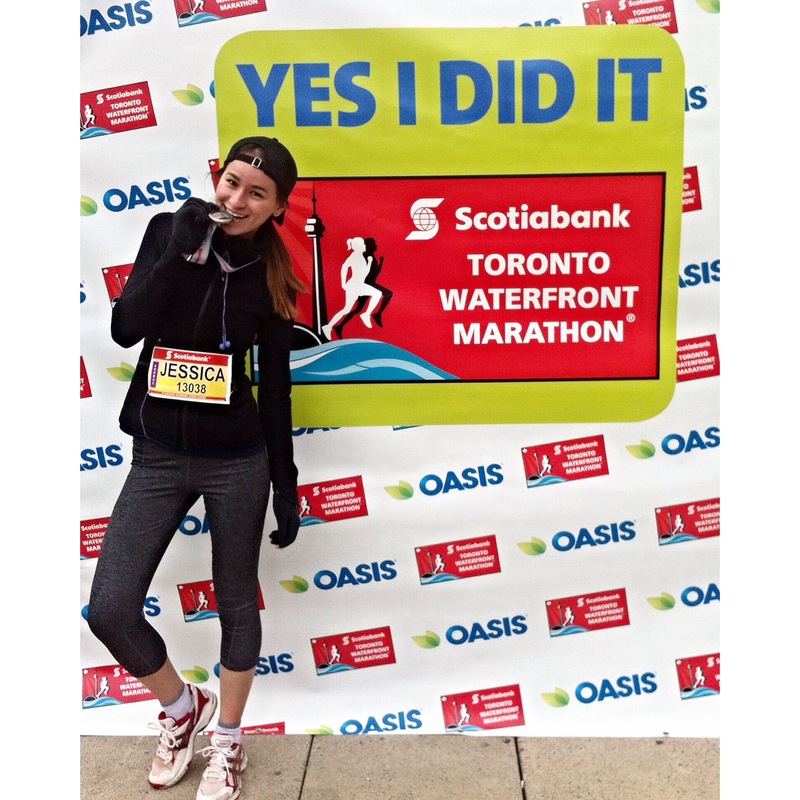 I realize my half-marathon was almost one month ago and I haven’t said a peep about it on my blog. I’M SO SORRY! October and November have been incredibly hectic and for an entire month I’ve been trying to figure out a routine since there were a lot of changes that went on. Needless to say. I’M BACK! I wasn’t so much nervous before the race, more anxious to get going. I remember the first couple kilometers I had a constant smile on my face, which may have looked incredibly creepy now that I think about it. I felt happy to be doing something for the first time and to know that this was a challenge I signed myself up for, not knowing what to expect. Looking around at the start of the race, I appreciated the pretty Toronto scenery, the athletes who were all there to complete a common goal, supporters who froze their butts cheering from the sidelines and most importantly, I loved knowing that for the next couple hours, nothing mattered but being present in this moment. Ahhhh, I was in my element and it was blissful. Or so I thought. Around 13k was when all the fun and games and hype of the race started to decline, the struggle got REAL. When I was training I’ve never ran the full 21k without stopping (I guess you can say I ended up just winging it). In the middle of the race I realized it has been a couple hours since I ate breakfast. I could feel my stomach start to rumble, a slightly uncomfortable feeling especially for a runner. Wasn’t sure what to do about it, I couldn’t just detour to a hotdog stand (although, the idea did cross my mind ). Luckily for me I came across these lifesavers.. 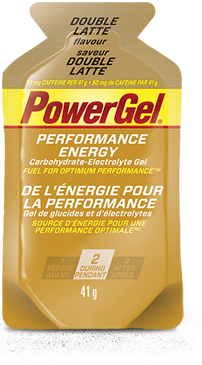 POWERGEL!!! Wasn’t sure what these were but saw people sucking them back so I thought, may as well give it a try and see what happens. I grabbed a couple from the volunteers handing them out (who were all so amazing and supportive along the race), opened it up and let the double latte flavour work its magic. It felt good to digest something flavoured and textured, there is only so much gato-sauce or water you can consume before it become bland and old news. In moments, the gel settled in my stomach and I was no longer hungry PLUS I had more energy. SMALL WIN! The last 3K was the hardest but absolute best. I could feel my body get heavier, legs aching, cold air getting harder to breathe in but, I was so close to the finish line! The final stretch came nearer, I could hear cheering getting louder, saw the red Scotiabank finish line banner getting closer and before I knew it, I crossed the finish line! I smiled to myself, looked around and took in the moment. I did it. After the race my mom gave me a huge hug, told me how proud she was and (like the amazing mother she is) took me out for Thai food. Pretty sure I ate my weight in noodles and rice that afternoon. My body felt great after the race, I think I was one of the lucky ones. My legs ached for a bit that night, but I woke up the next morning perfectly fine. I now want to take a moment to appreciate the existence of a few supporters that got me through this experience. My mother (obviously) who was there to film and take photos. Her video below. In the beginning you see a glimpse of me for a brief second and then she zooms in on a clown who took my spotlight. Whatever, over it. Big thank you to my cousin Melissa who stood outside in the cold to cheer me on and made an awesome sign. My friends who texted me prior to the race wishing me luck, Titika for providing my Wendy Crops and Marathon Jacket and last but not least – Britney Spears, Ariana Grande and Keith Urban for pushing me further and getting me through the race. Couldn’t have done it without you all. Massive Well Done!! I have just signed up for my first half marathon!